Welcome to the Ash Class blog! 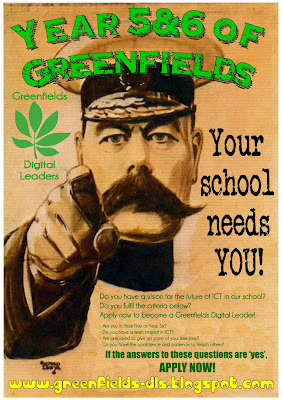 : Do YOU want to be a Greenfields Digital Leader? - and also contributing to the Digital Leader Network Blog. To apply to become a Digital Leader, you will need to go to the Greenfields Digital Leaders' Blog and find the link to the on-line application form. When the applications are in, we'll choose a shortlist of candidates to interview (don't worry - not a scary interview!). The deadline for applications is Friday 27th April - good luck! I don't know what to make for it. You'll have to have a good think about it! I'm sure you can come up with something fab on your iPad! I am doing a blog on my iPad and laptop. Mr Kenyon, I've done a Prezi! Check the classes E-mail! Ahhh... The intervew is tommorow!